Frankenstein would have been the perfect PTA mom! Just think about his skills in the lab. Trade in the vials for measuring cups and he would have been made in the shade when it came to the quarterly baked sale. We're curious about what Frankenstein's child would be like. Would the other kids make fun of the bolts in his verdant child's neck? We don't think they would. That tall forehead would be so darn charming in a kindergarten classroom. And the thing is, that moaning speech impediment that comes with getting shocked to life with lightning would be right at home with the other five-year-olds, don't you think? We think Frankenstein's creature deserves a happier lifestyle. This optimistic dream totally could happen when you order this toddler Frankenstein costume for your little one this year! 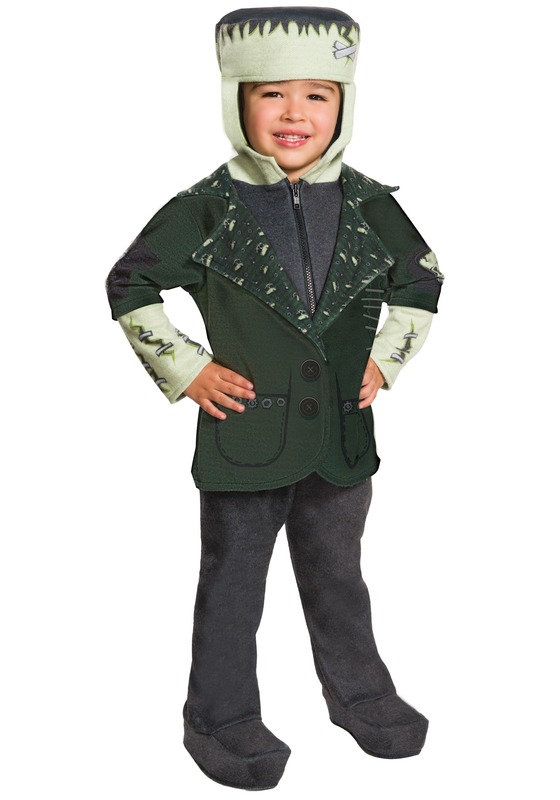 This Frankenstein hoodie jacket will be a favorite with your toddler. The jacket has a green blazer with printed buttons, cogs, and stitches on the forearms. The hood is adorable with a high forehead with shaggy black hair and bandages. The pants are attached to shoe covers so that you don't need to worry about the boots covers slipping as your child trick-or-treats. Your child will love becoming Frankenstein's kiddo so much that you might find that he or she wants to break the jacket out throughout the year. That's totally okay cause everyone will find this zip-up blazer and monster head adorable. Just make sure he stays away from fire not that that's anything new. Want to make this a group costume? Mom and dad can go as the original Frankenstein, bride of Frankenstein, and maybe even a mad scientist. There's no party like a monster party cause a monster party is really wild!